Just Between Friends is a HUGE children’s and maternity consignment sale. Sort of like a giant community garage sale. Consignors bring their new and gently used clothing, gear, and toys to sell at this 3-4 day event. Usually held at convention center-type locations, Just Between Friends events can be found in cities all across the country. Find an event here. Register as a first-time momma (dads, and grandparents too!) and gain VIP access one day before the sale is open to the public. Consigners and volunteers are also eligible for early access and presale. Consigners who also volunteer earn a larger profit on items sold. Kids and Babies are not allowed during presale. The only exception – “nursing” babies who must be worn in a carrier or sling. I remember reading that strollers weren’t allowed at all… however, this is definitely not enforced. They do offer big blue Ikea shopping bags but best to bring your own/ leave with your own (full of treasures). My first experience with JBF was before Olivia was born. I attended the Plano Sale on the last day (knowing that the selection would be picked-over) having every intention of just looking to see what it was all about. I walked out $15 later with an armful of gently used (some even new with tags) outfits, a bassinet frame (I ditched the mattress pad + sheet set) several classic kids books and a wooden chandelier to hang in the nursery! This weekend is the Dallas/Mesquite Sale at the Mesquite Rodeo Exhibit Hall. Schedule Here. Thursdays are definitely the best day to shop the best selection and totally worth the $3 entrance fee (only charged on Thursday). It’s best to go with an idea of what you’re looking for otherwise it can seem overwhelming. This was my first time attending the Dallas/Mesquite sale and it was easily 4x bigger than the Plano event. 50+ people in the check-out line… definitely crowded! My friend Michelle brought a stroller in today with no problem…I have mixed feelings about stroller vs. baby wearing, definitely benefits & drawbacks either way. I’m a baby wearer and Liv stays happier but as she gets heavier it might get more challenging. Very Good Condition. I’ve been thinking about buying one of these but just couldn’t justify the price tag (new). I’d seen the cloth variety at resale shops around town but really wanted one with a tray. Liv is already a huge fan. Sturdy, Loved, Cheap – a definite DIY project. 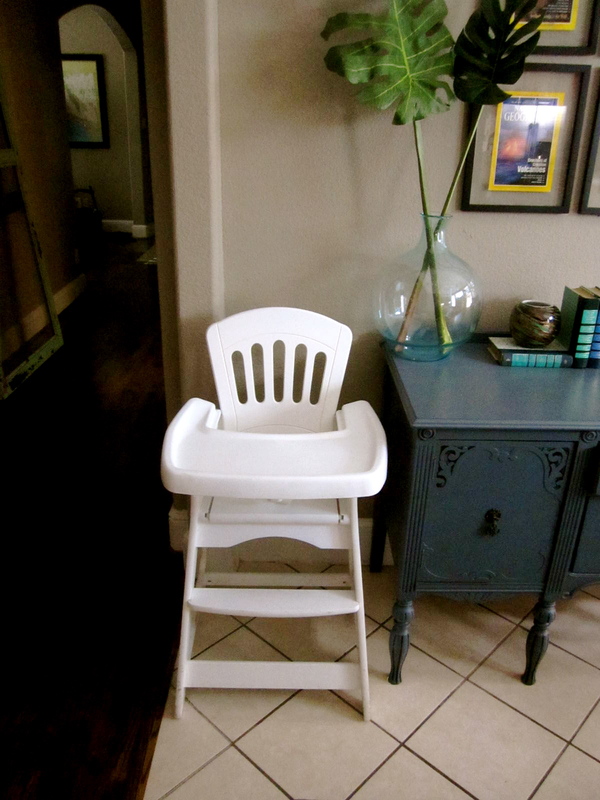 For some crazy reason, I didn’t think to register for a high chair when I was pregnant. I guess 6 months just seemed like an eternity away. But let me tell you… 6 months FLEW by. 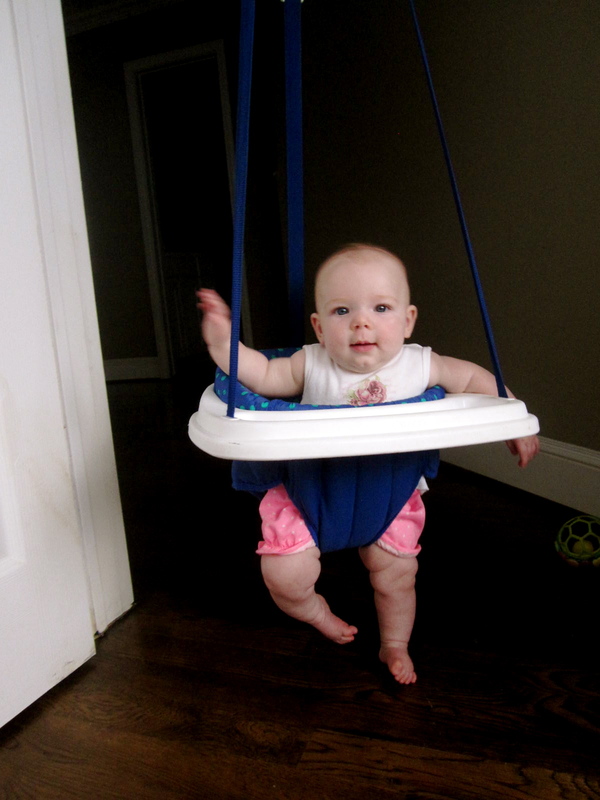 And now we’re gearing up for solids… needing a high chair. This bargain variety came with a darling teddy bear cover/cushion that I’m going to disassemble, study, and recreate (with help from Michelle – who is going to teach me how to sew – Check that off the 2012 to-do list) using fabric that better represents Liv’s little personality. Also considering a new coat of baby-friendly paint to cover the “love” marks and scratches. Definitely an awesome opportunity to find great stuff for kiddos and babies. Eventually, I’m going to get my act together enough to volunteer + sell. Any of you other momma’s ever shopped, sold or volunteered at a JBF sale? Where do you buy budget-friendly kiddo stuff? This entry was posted in Mom Life, Momma Meg Loves and tagged budget-friendly, consignment, graco, high chair, JBF, johnny jump up, just between friends, Mesquite rodeo hall, resale, shopping, thrifted.